The rainbow's the limit with digital, full color graphics. 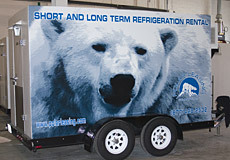 Our wide format printing offers the versatility you need: interior, decor, trade shows, publicity events, outdoor advertising, vehicles, window decals and more! 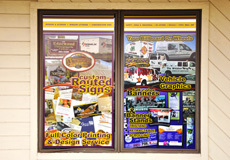 We stock 13 ounce gloss and matte banner available for interior and exterior durability. For printing decals, to business front signs, to vehicle graphics, we carry standard white, translucent white and clear vinyls. Perfect for trade show displays and banner stands, we offer this rollable PVC in 9 mil and 12 mil. We can print your photograph or artwork onto canvas for a high-quality artistic look. This specialty, solvent-printable fabric works great in banner stands and hanging displays. With blow-through capabilities, mesh banner stands up to windy conditions and locations. Apply to windows to give added privacy and advertise at the same time: you can see out, but they can't see in. An 8 mil paper material meant for temporary banners or framed items. 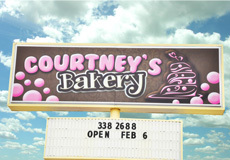 Use this in interior light box displays to really make your lighted piece stand out. This material is printable and totally removable, and with laminate, extremely durable. For interior applications that may be time sensitive or need to be removed at a later date without damaging the wall. Items listed above are usually kept in stock. There are many more special-order options available. Just ask!